1) Prorated – Depends entirely on the progress report on the Work. So, as and when a resource updates his % Complete cost is accured and payment could be release accordingly. 2) Start – These could be used for resources / vendors which needs to be paid right at the begining of the assignment. It is like you pay before and use later, this accumulates to Project cost to refelct that a cost has already been expensed and added to over all Actual Cost of the Project. 3) End – These resources get paid after completetion of a task; their cost gets added up to the Actual Cost only when a task is 100% Complete, so this is not getting added to the Actual Cost anytime before marked as done. 1 ) Created 3 Tasks and 3 Resources as following : 3 Resources without table as Prorated, Start & End. 2) Assigned them to tasks named accordinlgy. 3. Baseline the Schedule, and mark all tasks as 50% this will now add to EV Calculations, see the ACWP of Start Accured is the total value and for End Accure it is 0. 4 )Looking at Resource Usage View with Actual Cost inserted into the sheet view you will notice that it remains front-loaded for Start Accure and 0 for End Accure. As, you can see here AC of Start Resource get accumulated at start itself while for end accure it shows towards end of the task. It generated a Cost Varince for Start Accure by -8$, while End Accure doesn’t have impact in CV but both shows the updates in VAC -8$ when made 100%. This is the most exciting option, you can always get a Variance for already planned Cost (it behaves same in Start and Prorated) while the cost which you decided to pay at End doesn’t accumulated in CV. This feature is excellent in giving factual CV but there can be still an exception when a PM says that even though resource was End Accure and not budgeted in terms of cost at start, but was budgeted for Work at least and that should generate CV. But the tool assumes that a cost which was not budegeted ahead, shouldn’t be part of Cost Variance as it shows BCWP – ACWP, yet the EV reflects the deviation exactly as required in VAC. In one of my client engagement I was asked to maintain the Budget cost for some tasks and based on it depict if that task is getting over-budget or still on track. Say if it is a Product Development Plan, wherein the Clients have set some Budget for Marketing on Visual Ads, Paper Ad and Internet postings and they want to track the Over-budget. Tasks have resources assigned to them which themselves have Standard Costs assigned to them. 1) Assign Std, Per Use Cost & Over time Cost to the Resources. 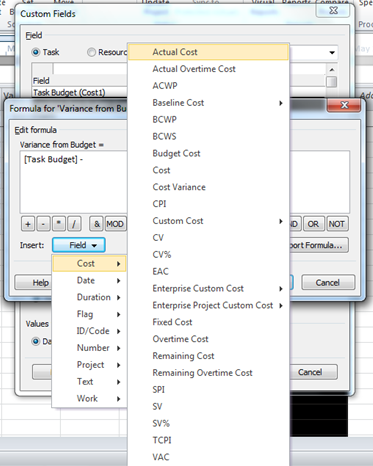 4) Create a Custom Cost Field – Task Budget, in Cost 1. 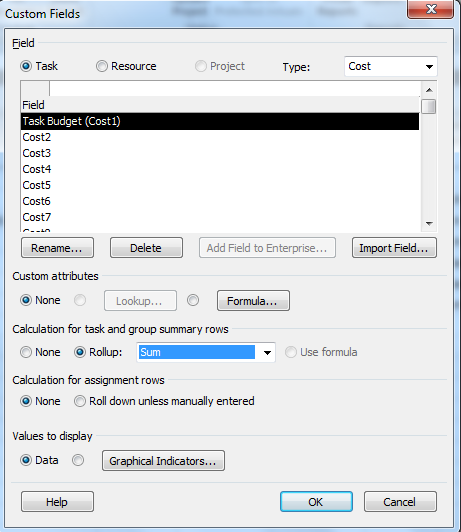 5) Add Fixed Cost to Task ID 2 and insert the Task Budget field in Cost View. 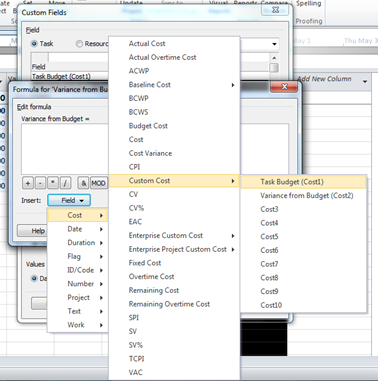 Assign Budget to each task. 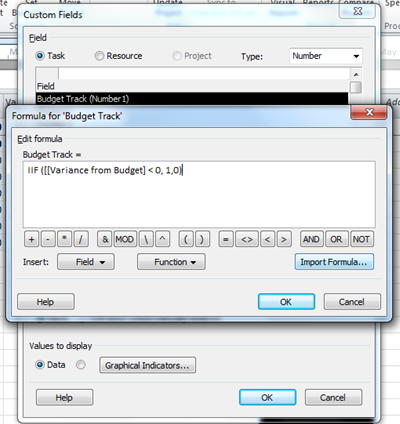 6) Create Custom Number Field – Budget Track in Number 1. This will have a Formula which would pull Indicators. 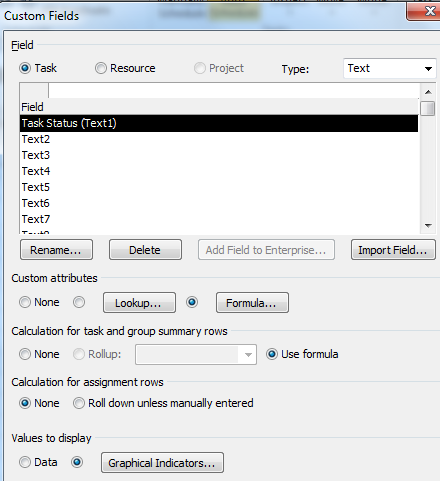 7) Now Update the % Complete for tasks, based on the task names which are named as to show the way it is updated. 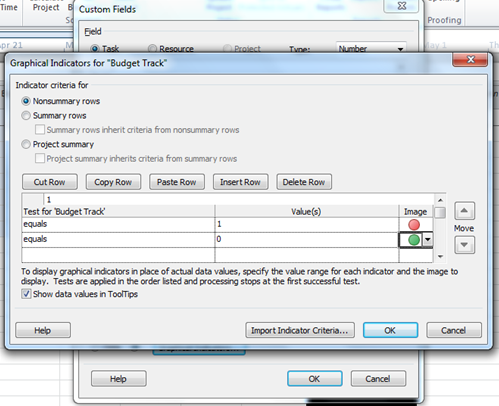 8) Task ID 3’s duration was increased after Baseline, it is still in progress but already Over Budget. Task ID 6’s duration was also increased and it is completed. This worked the way as Client expected at the end we could decide the over-all Budget Variance on the Project too. 4.) 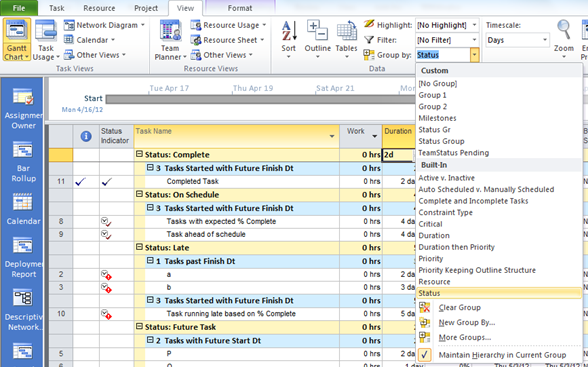 Future Tasks – Blank, they don’t have any indicators. The strength of the field is its ability to calculate without baseline, which is considered as a strong base for any comparisons. The algorith of the field works directly on Start / Finish /Current Date and Duration to reach out to the Calculations. When you have thousand line items in a schedule and you are clueless on delayed tasks based you can use Group-by with Status Indicator and Status fields to get list of tasks which you need to focus on. Go to “View “Tab -> Group by: -> Build-In select “Status” this gives a clear picture of tasks under different categories which is a very neat representation. Below is an example, I have inserted Planned % Complete Column (Another Formula Field) to show how much should have been completed as on the date to compare with % Complete. It was a thing I forgot long ago, as I never got a chance to use it 😦 but today on my forum a user asked a similiar query – which Resource Detail option could satisfy so effortlessly; this is such a good feature that most of us have been missing it for a long while. It could be used in case where we want to edit a Resource’s Information while viewing all his/her tasks in a single pane. The user mentioned about Cost assignment based on a resource allocation on a project, there could be several such scenarios. 1. 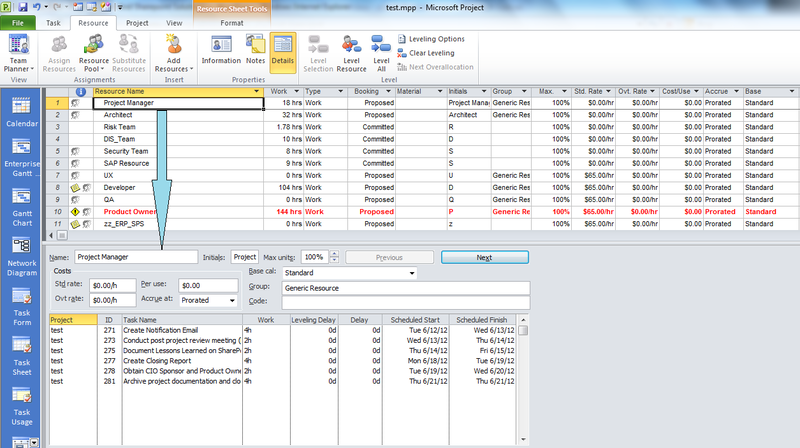 Open the Project Plan, go to Resource Sheet View. 2. Select Resource Tab from top ribbon and click on Detail Icon over there. This will split your Window pane. 3. Select a resource name in Resource Sheet, Detail section will list all required information and give you 1 Stop to view all assignments as well edit the details of the resource. 4. There are Next & Previous Buttons to navigate from 1 resource to other. This makes life so simple. The most identifiable cause of Circular Relationships is links on Summary Tasks. Best practise says that the links to & from Summary Tasks should be avoided as they could lead to Circular references. At a time, with a large project plan of thousands of line items, pinning down a bad link becomes very difficult. Prior to attempting any of the 2 options listed below – Turn off Automatic Calculation from File – Options – Schedule – Calculation Tab. Then go to View – > Outline -> All sub tasks to expand the file. 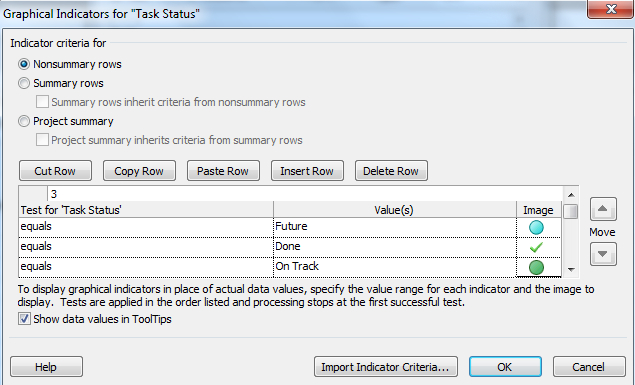 1) Insert Predecessors and Successors column in a task view. Now delete all summary links from both the columns to eliminate any traces of circular reference. 2) Yet another quick way is create a Custom field and copy all Predecessors into it and delete all values from Predecessor Column by pressing SHFT + CTRL + Down Arrow to select all values of the column; Now copy-paste values from this custom field to the Predecessor column. If there is any circular link, Project will throw the message that which all links are erroneous, you can delete them. I’m relying heavily on everyone’s support and trust, without which I won’t be able to make second comeback!! The first article in a series of eight articles about how to use Microsoft Project Web App to work with Microsoft Project Server 2010 data and to perform project management-related tasks.